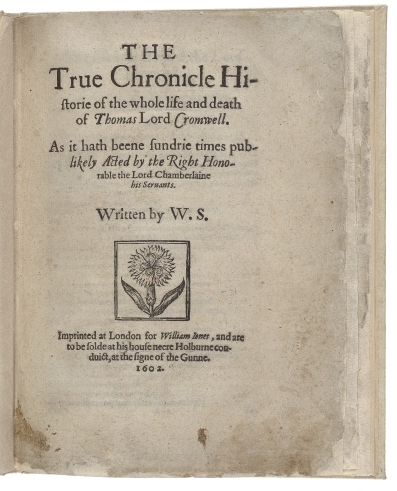 THE True Chronicle Historie of the whole life and death of Thomas Lord Cromwell. As it hath beene sundrie times publikely Acted by the Right Honorable the Lord Chamberlaine his Seruants. Imprinted at London for William Iones, and are to be solde at his house neere Holburne conduict, at the signe of the Gunne. 1602. Title page imaged from Folger call number: STC 21532. Image is from the transcribed copy.